Fits hearing aids from multiple manufacturers. One hearing aid manufacturer is not able to provide enough options for all patients and it’s impossible to keep up with new products and programming software from all of the manufacturers. Our audiologists are familiar with the top national manufacturer’s. Willingness to refer patient to other professionals when necessary. Maintains clinical standards of competency and continuing education. Is concerned with the patient as a whole and realizes that hearing is just one (important) part of an individual. Hearings aids are not “one size fits all”. Many factors go in to choosing the right hearing aid for each individual. Our audiologists have over 35 years of combined experience and fit hearing aids from multiple manufacturers! Custom hearing aids are available in various sizes from Completely in the Canal (CIC) to an In the Ear (ITE) Hearing aid. Completely in the Canal are the smallest and they range in size up to the In the Ear style. The smallest aid is appealing to those wanting an “invisible” option. The larger custom hearing aids are sometimes chosen for people with limited mobility and tactile sensation in their fingers. Pictured below from right to left Completely in the Canal, In the Canal (ITC) and In the Ear custom hearing aids. RITE hearing aids are the most popular hearing aids currently on the market due to their discrete appearance and versatility to accommodate a wide range of hearing loss. They are so lightweight that people forget they are wearing them. This size of hearing aid is appropriate for nearly anyone. The BTE is coupled to the ear by a custom earmold. Behind the ear hearing aids are good for people with decreased dexterity and wax accumulation problems. 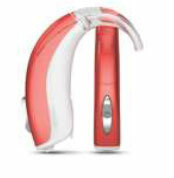 These hearing aids tend to be more powerful and provide the most volume available. Tinnitus maskers are available in many of the hearing aids we offer to help provide relief from ringing in the ears. For those who have normal hearing but still suffer from ringing in the ears relief is available in many forms. Ask our audiologists for more information. Hearing aids are compatible with Bluetooth devices. Many of the current Bluetooth devices enable you to talk hands free on your cell phone and allow you to hear the person you are speaking to in both ears. Some of these devices also help you hear better in noise, when multiple are talking and when distance is an issue (lecture hall/church). Many schools, theatres, churches, museums and public transportation use FM technology which can be personal FM or public/looped FM technology. Personal FM technology is most often used in school districts to help students hear their teachers. 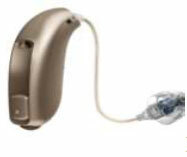 Public FM typically utilizes the telecoil in hearing aid devices to allow multiple hearing aid wearers to connect their devices to a primary signal source (pastor, teacher, speaker). This enables them to hear over competitive noise sources such as reverberation, echo, and environmental noise. Whether you need custom hearing protection for a specific occupation, hunting, musician’s earplugs or to wear at concerts we have a wide variety of colors and options for you to choose from. We also offer recreational molds for swimming, sleeping and listening to music.